This property is 2 minutes walk from the beach. 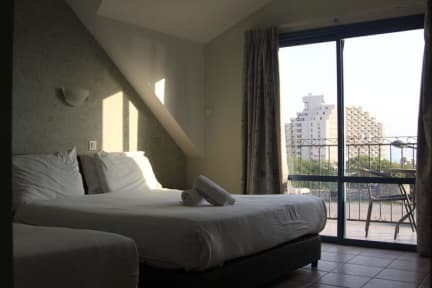 Set on the shores of the Sea of Galilee, Aviv Hostel offers dormitories and rooms overlooking the lake and the Golan Heights. Wi-Fi and parking are both free. Rooms at the Aviv include cable TV, a mini fridge and electric kettle. A shared kitchen is available for shared use, and breakfast can be booked and enjoyed at Emily's Hotel next door. Some rooms come with a balcony. 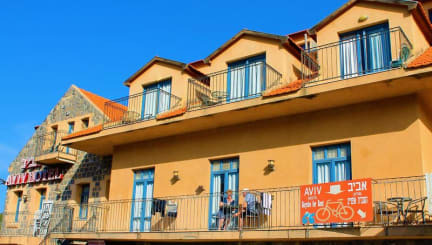 The Aviv Hostel is just 100 m from the Old City area of Tiberias. The lake shore is 50 m away and includes a number of fish restaurants.